Neither am I a photographer nor a traveler. But I do both. When I travel for pleasure, I share lots of pictures and then blog, because I am only a blogger. My travel experiences that I share here are my memoir. Now, it's not everyday that I introduce myself in my posts. Am a simple town girl from Manipal and there are three things I love in this world. My blog, my blog and my blog. Well, and so it happened, that one morning not long ago we landed in this place called "Sevagram'. So getting to the point, Sevagram is a small village, renamed from originally "Segaon". Sevagram is about 5 km from Wardha town and 50 kilometers plus from Nagpur in the state of Maharashtra. The picturesque roads with faint smell of dust and dung; Beautiful Prussian blue buffaloes that consume more space on the roads than your SUV; The vegetable vendor squatted by the roads sides with hand towels wet scrubbing the sweat even in the monsoons; Driving in rural areas has its own bumpy charm. Now, we had reviews about this place about being historically popular for M.K.Gandhi last resided here before his march to the strike for Independence. He had decided to make this his headquarters until his struggle for independence succeeded. 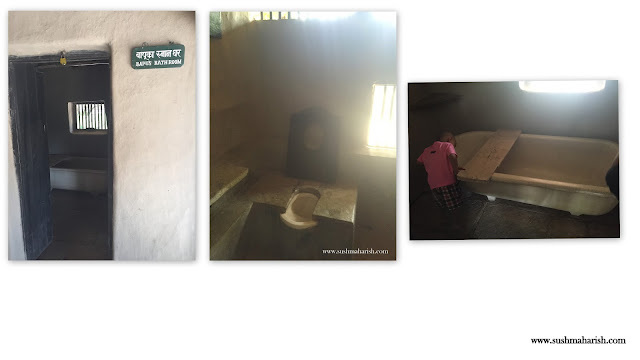 Shortly after his untimely unfortunate demise, this place started turning into a historical place, a museum reflecting the aura of activities of this freedom fighter. He had used this place as office too and the place was supposed to have spiritual vibe. 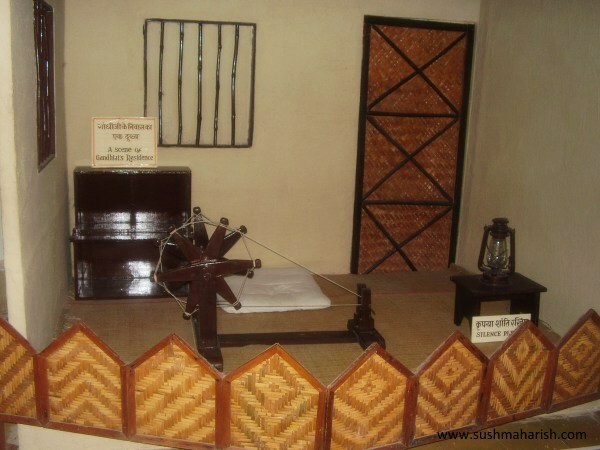 That was not all, I was told about the finger licking food, the Maharashtra thali (meal) that was served in the canteen of the museum in this place and the exotic collection of hand-woven Khadi cloth. You get to walk inside a path with no asphalt, covered on both side with gigantic trees, a few shops lined near the gate that sell the authentic Khadi cloth, into a wide compound. The various "Kuti" or the Katcha houses with hay thatch here and there mark the rural beauty, showcase the scenes of the great freedom fighter's habitats. The house that he lived in with his wife . Kasturba Gandhi with its uneven mud flooring, the bathtub that blended with luxury for that era; the office space with a now antique wooden table, the neatly kept glass shelf with few bits of paper clippings and an honest letter of love he wrote to his wife when she was ill; and telegrams of those times are the main attraction here. One can definitely get the feeling of waiting at the door as if for an appointment with Gandhi himself. This model Gandhi with shining scalp is my sonny, too excited, unable to understand if this was a house we wanted to buy and stay in!! Accordingly he inspected the bathrooms and other rooms and declared the place was nice. It is beautifully constructed new concrete building that exhibits master pieces from life and habitats of Bapu times. The display is well polished and well-kept. As for me, I felt like a revisit to the class 10 history lessons and as for my kids, older one was busy studying details of each and every exhibit. She was first introduced to Bapu by "Lage raho Munna Bhai "and my little one hopping like a happy rabbit unknowing why the hell were we busy watching old tables, chairs, lamps and stuff like these while there was the smell of food and sight of ice cream right outside the building. 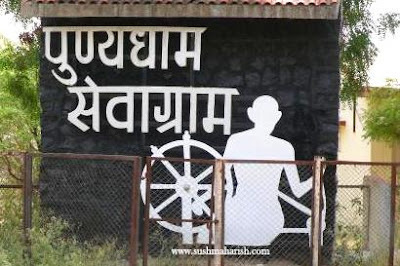 The most important thing to do is to visit the canteen with beautiful ambience , cane furniture, and the authentic Maharashtra food with the ghee smeared "Puranpolis," Kokam kadi" and 14 other delicacies served in lovely steel plates that come in "family size". A super example of best quality and most quantity at a time. Any travel includes food and more food but this one includes food and rich and best food! A historian or a would be historian would love to explore this place. Nevertheless any nature lover too will end up exiting the place with a happy smile. Our Nagpur visit got a lovely touch touring the serene interiors of Sevagram village. And then, it all ended there. Nice. I did not know about this place. Thanks for sharing. Will visit when I go to Nagpur next time. Yes, You will definitely like it. Naughty At 40 Or No-Tea At 40?